The Mark 11 specification is shown below. It details the timing requirements and the dial design and waterproofness among other aspects of the watch the MoD wanted built. 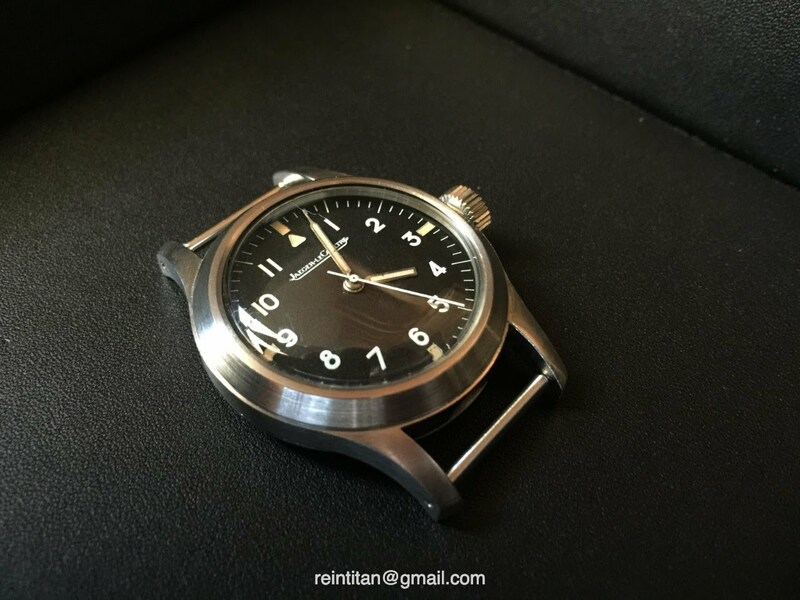 Mark 11 watches are given the MoD designation of 6B/346 wherein 6B is the code for the Royal Air Force (RAF) and 346 is the code specific to the watch for this specification (and is not a serial number). While the Mark 11 watches from JLC and IWC each fulfilled the specification to win the contract, each watch had its own history. The JLC Mark 11 was only in production for a relatively short time--from 1948 to 1953 with around only 2,950 total watches built in several batches. Further, the JLC watch was supplied to the RAF and then later to the Royal Australian Air Force (RAAF) in 1953. These RAAF examples are more rare than the RAF watches. 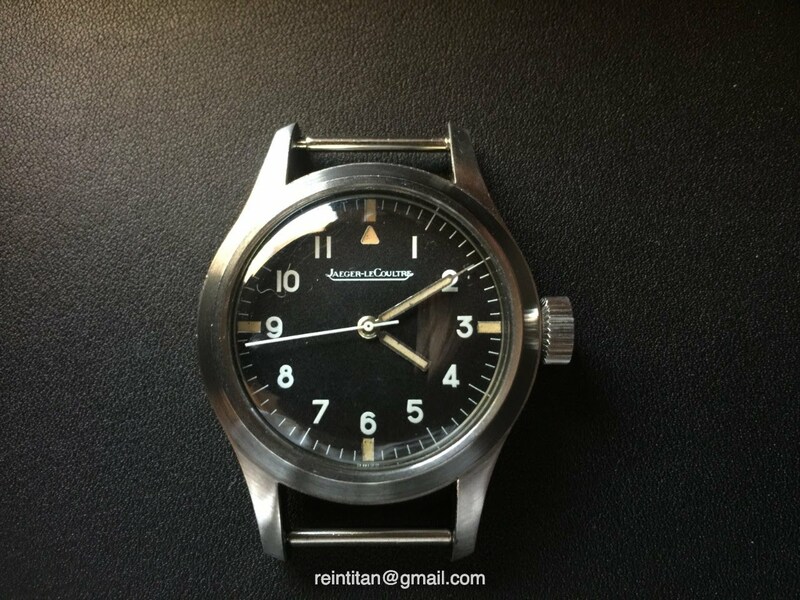 Unlike the IWC, no civilian version of the JLC Mark 11 was ever made. The JLCs were all destined for the armed forces. 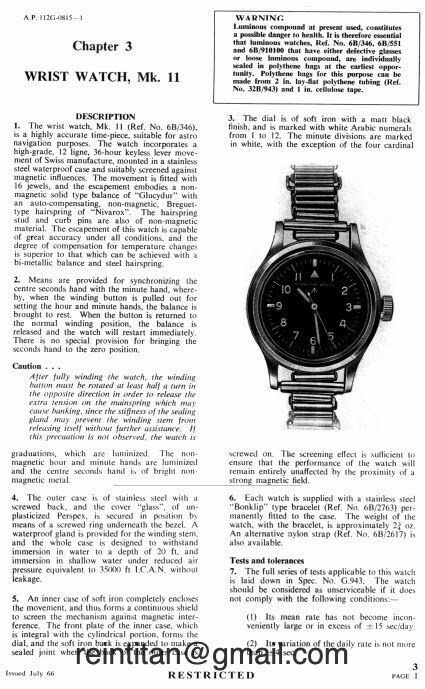 The Australian watches had some differences from the British. The RAAF dials lacked the Broadarrow (the mark of MoD property) and they featured a "flat 3" compared to the "rounded 3" of the RAF dial. The RAAF watches also had G.6B/346 or G6B/346 engraved on the case back. The hands were a little longer than their British counterparts and were always of the "Square Hour" type. The serial number on the movements were engraved on the base plate of the cal. 488/SBr rather than on the top bridge. Finally, the RAAF watch had spring bars rather than fixed bars. Domed factory replacement crystals can still be had along with other OEM parts. PM me if you want a source. One of the best examples out there. The original brush finish on the case is intact. Do you have the entire extant examples of the Smiths DeLuxe 6B??? Wow. Those watches are rare as rocking horse poo. White 12 JLC and IWC! The original and most rare version of the dials! Superb!